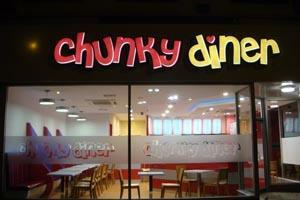 Chunky Diner01924 210019work RestaurantAll food is prepared with the highest quality ingredients, freshly prepared on the premises. Portuguese style Peri Peri chicken is a unique taste unrivalled by any other. Pizzas are prepared with freshly made dough and toppings of your choice. The modern interior design is certainly eye catching and brings a vibrance to the city. The staff are well trained in customer service and will go out of their way to ensure a pleasant experience which will certainly leave you wanting to return again and again. We now offer free deliveries on orders above £10.00 within a 3 mile radius. All food is prepared with the highest quality ingredients, freshly prepared on the premises. Follow the signs to The Ridings. Located opposite the Wilkinson store on the main roundabout.